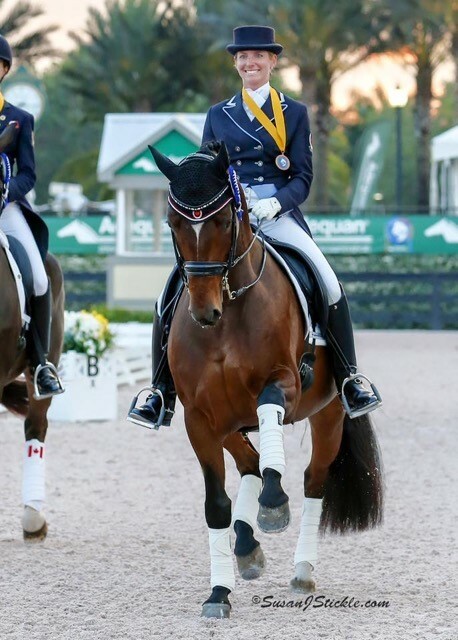 South Florida dressage judges have been impressed with the efforts of the Canadian husband and wife team of Tina and Jaimey Irwin this winter season. With outstanding results on their up-and-coming horses, they have scored in the ribbons on horses they developed and brought up through the ranks. The strength and consistency of the Irwin’s training resulted in two of their horses, Donegal V and Laurencio, at the very top of their classes in their first Intermediaire I competitions. Donegal V is a 17.1 hand 8-year-old dark bay Dutch Warmblood gelding by Johnson out of a Gribaldi mare and owned by the Team Irwin Supporters Group. He was imported from Holland as a 3-year-old and developed by Jaimey with international competition in mind. 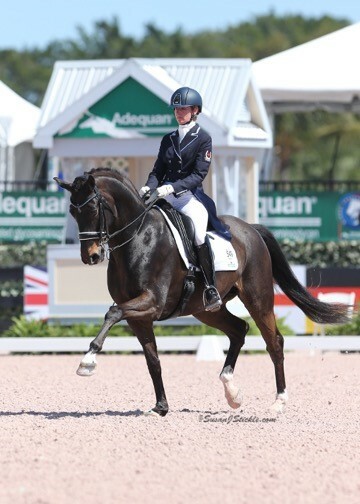 At the Adequan Global Dressage Festival late January show, Jaimey and Donegal earned a blue ribbon in the Prix St. Georges with a 71.447 percent. Then in February, the horse and rider notched an impressive 76.053 percent, a fair gap away from the second placed horse, and a 73.684 percent in Donegal’s first foray into the Intermediaire I. 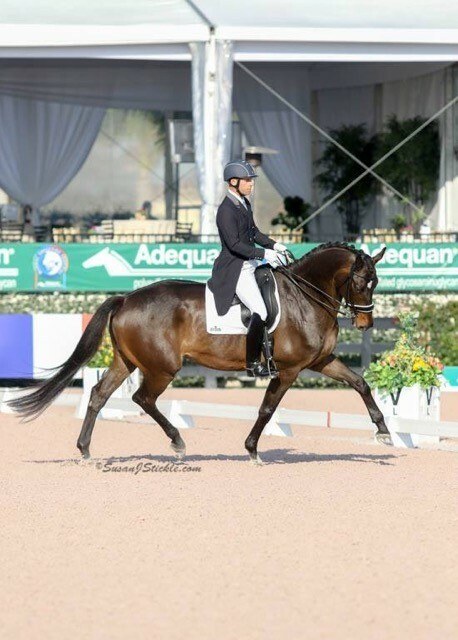 At the March Palm Beach Dressage Derby held at the Global Dressage Festival show grounds, they placed third in his first CDI at the I-1 level with a 70.482 percent. In his second CDI at I-1, Donegal placed second with a 70.368 percent. Not to be outdone by her husband, Tina and Laurencio, a 9-year-old Oldenburg gelding by Laurentio out of a Donnerhall mare, are also competing in the gelding’s first year at the small tour level and making waves in Wellington. Imported from Germany for Tina to take into the international arena, Laurencio made his remarkable Intermediaire I debut in January and earned a 71.579 percent for a first place finish and a 72.237 percent for a third place ribbon. At the AGDF6 show held in February, Tina and Laurencio nailed the blue ribbon in the I-I twice with a 76.842 percent and a 76.579 percent, besting Jaimey by a half a percentage point in the same class. 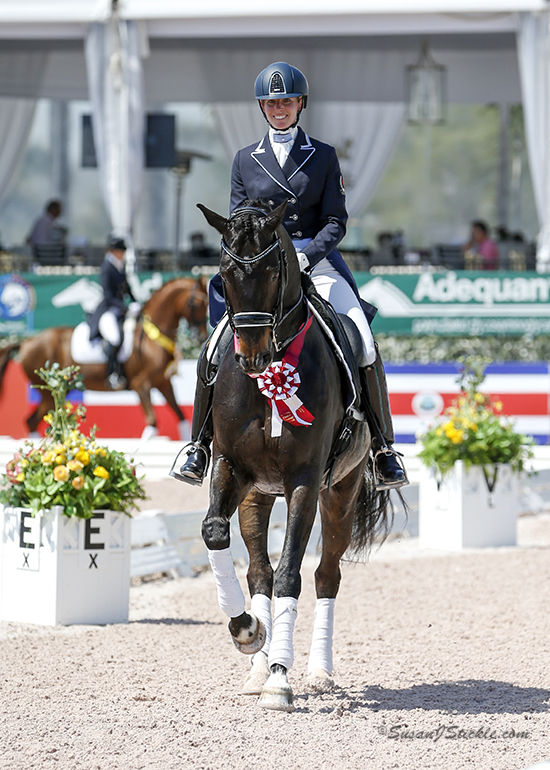 The gelding, owned by the couple, placed sixth in his first CDI at the Prix St. Georges level with a 68.289 percent. At the AGDF10 show in mid-March, Tina and Laurecio earned a 70.307 percent in the Prix St. George and a 70.368 percent in the Intermediaire I.
Tina also rides Fancy That, a 16-hand, 10-year-old Oldenburg mare by Donnerschwee out of a Freiherr mare who is owned by Stoney Lake Equestrian and Rocket One LLC. Fancy was imported from Germany as a 4-year-old and brought to the Irwins as a sale horse when she was 6. A client in the barn ended up buying her and kept her with the Irwins to develop so that Tina could compete with her, and the relationship has blossomed. 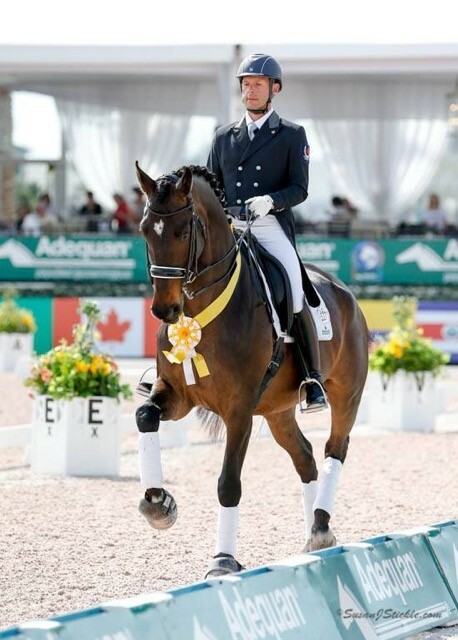 In 2015, Fancy was a member of the Canadian Bronze Medal winning Nations Cup Team and captured the Intermediaire I Freestyle with a 74+ percent at the Adequan Global Dressage Festival in Wellington. During the 2016 AGDF season, the pair have consistently placed at the top in the small tour with a 68.711 percent in the Prix St. Georges, a 68.921 percent in the Intermediaire I and a 70.275 percent in the I-1 Freestyle. Another impressive up-and-coming horse the Irwins are training is San Raphaello, an 8-year-old Oldenburg gelding by San Amour out of a Lancer 3 mare. This 16.3 hand dark bay known as Springer for his penchant to jump his paddock fences and his air-bound trot is owned by Mary Ellen Horgan and imported as a 6-year-old for Jaimey to ride and develop. At the AGDF4, Jaimey and San Raphaello added two blue ribbons to the stall door with a 73.33 percent in Third Level Test 1 and a 76.154 percent in Third Level Test 2. At the Palm Beach Dressage Derby, they notched another top win in Third Level Test 2 with a 69.872 percent. The Irwins will return to Canada to Stoney Lake Equestrian, www.stoneylakeequestrian.ca, in Stouffville, Ontario, at the end of the 2016 South Florida winter show season. They will also return to Europe to look for more young horses and to scout out a horse for a client. 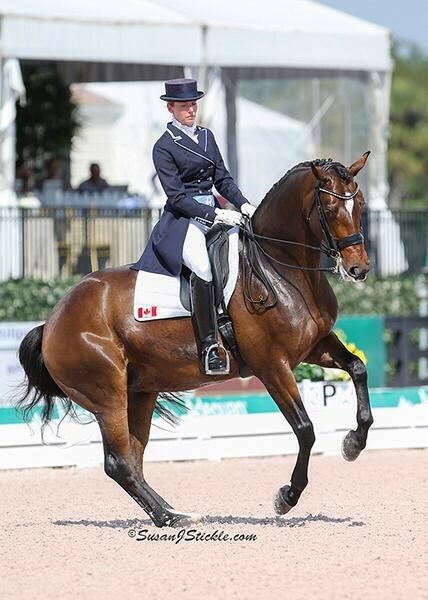 Their goal is to continue moving up the ranks with their impressive horses with the ultimate wish of competing for Team Canada in the future−especially as a husband and wife team. They recently began training with Ton de Ridder, a highly sought after coach from Germany. In fact, he has several riders in training who are headed to the 2016 Olympic Games in Rio do Janeiro, Brazil, this summer. Jaimey met the trainer at the 2013 Reem Acra World Cup in Gothenburg, Sweden, when he was competing for Canada. “He’s the perfect fit because we’ve had really good training developing the horses and now we need a good coach for competition, which is exactly what his specialty is, so it’s perfect,” Tina said. With the Irwin’s new generation of upcoming talent, they are poised to be a force to be reckoned with in the international dressage arena. They know they couldn’t be bringing up their stable full of talented horses without the support of many generous people and companies. Team Irwin Supporters Group is a syndicate for Donegal V, Rocket One LLC is a co-owner of Fancy That and Mary Ellen Horgan owns San Raphello. Sponsors Equine Lux, Brooks Feed Store, Kentucky Performance Products, Schleese Saddlery, Equinety and ZAP Productions, who provide their freestyle music, all help Team Irwin on their road to the top.